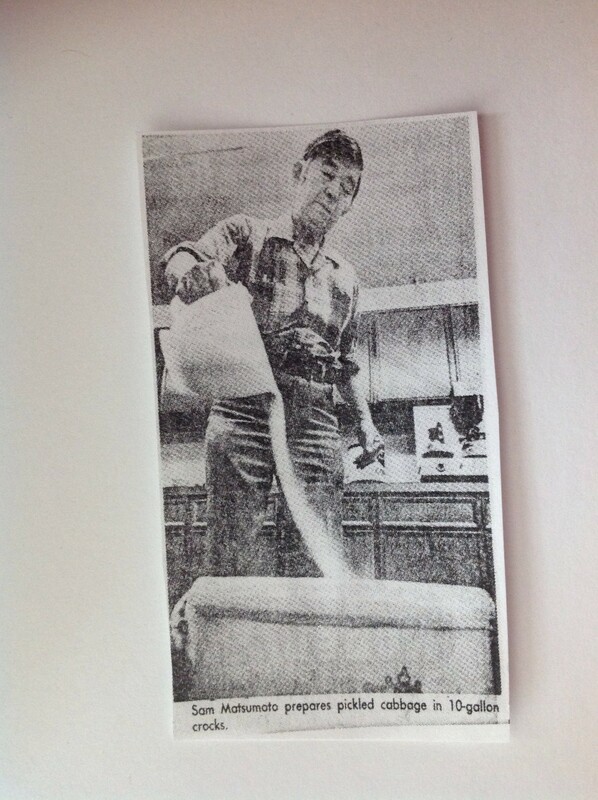 My dad Sam Matsumoto was an awesome Pickler! We had a refrigerator in the basement dedicated to pickling adventures. In this refrigerator you could find fish pickled in a miso concoction! There were vegetables pickled an old rice and salt. And the kimchi, with and without the stinky stuff (fish). This pickling is something you inherit and can’t fight. I dabble myself in pickling and Sam’s son, the other Sam Matsumoto, also has started pickling. We just can’t seem to help ourselves! 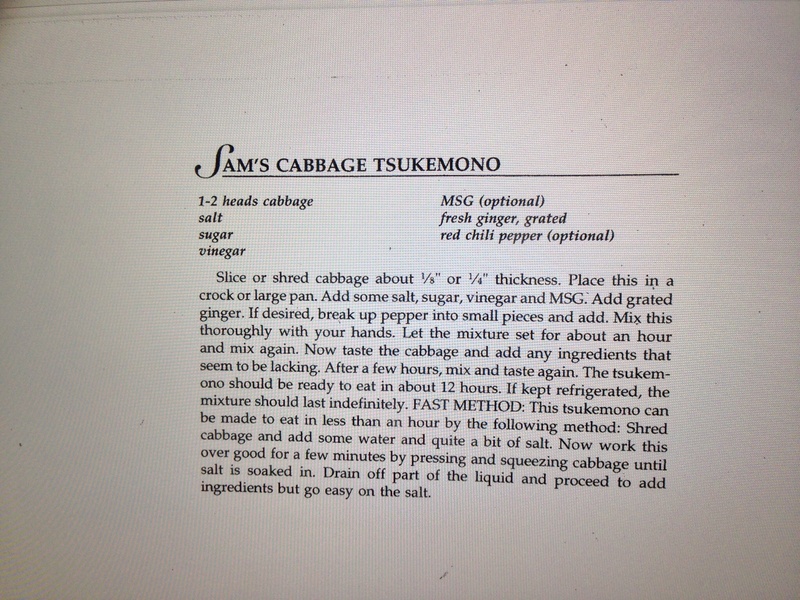 Here’s Sam’s cabbage recipe which used to be served as a side dish to the annual bazaar meal (teriyaki chicken and pork chow mein) of Simpson United Methodist Church. The recipe is true to the Sam Matsumoto way of making this pickled cabbage. I used to help my dad make this cabbage and he really would taste it several times a day and add “what was needed”. He’d have several huge crocks of this cabbage going at the same time and each crock would need something different when he tasted it. Love the Dragon Boat Festival! Especially the blessing and the procession of all the monks. Last year my daughter and grandson and wife all participated – it is sooo much fun! Dying to try the cabbage recipe – it looks sooooo good! Thanks! All the wonderful little pickled side dishes during a traditional Japanese meal is pure heaven. Praise be to all Picklers! Growing up we had pickles with every dinner and sometimes lunch. My dad always had something going! Thanks for sharing this recipe for pickled cabbage. I have everything here including Napa cabbage, which is more tender than our California variety. Can’t wait to take this to a party and share. I’ll bring the recipe and print your blog site. I’ve found a fun recipe 3 x5 card form and will see if I can fill it in with this with instructions to taste. Let me know how it turns out! Thank you for The comment and the follow. Hi, thanks for stopping by! glad I found your blog, you have a lovely corner here! Thanks for checking out my blog, I’ll definitely visit your student journal. My family gets together a few times a year with the crocks to ferment cabbage then later to can it. Started long ago with my Grandma Laura and now we carry it on in her memory. Love how cooking can bring family and friends together and share great stories. Thank you for sharing yours! hello,i read your blog you are having a very good topic and writings, i invite you to please keep visiting my new born blog about pets:https://petimals.wordpress.com/ .I am still working on it ,have a good day thank you. That is so Pinterest-worthy! May I please make a Pin of said recipe? I promise to credit you! As the “pinner” do you have ultimate control over the image? Were you thinking of just the recipe or the entire post? I was thinking of sharing only the recipe. Okay, we can try it and see what happens. Do you have ultimate control over the pins you create? Hi there, thanks for your comment on my very first blog. I like the sound of your pickled cabbage. Can I use any cabbage at all? My dad used regular green cabbage for this particular recipe. I have used that mix of green and purple cabbage with shredded carrots and that has worked too (the coleslaw pre-shredded mix). I love eating porridge with pickles! Looks wonderful! thanks for sharing this! very nice I like authentic recipes! Thank you Lynn, I have checked out your blog and am glad to have found you. I am following you now your blog is great! Thanks yours is too and different! So I like that allot!